Good morning and a happy weekend to you! It promises to be a glorious, beautiful weekend here in Kansas. The first hint of spring! I’m going to stitch with my windows open today, even if I freeze in the process. 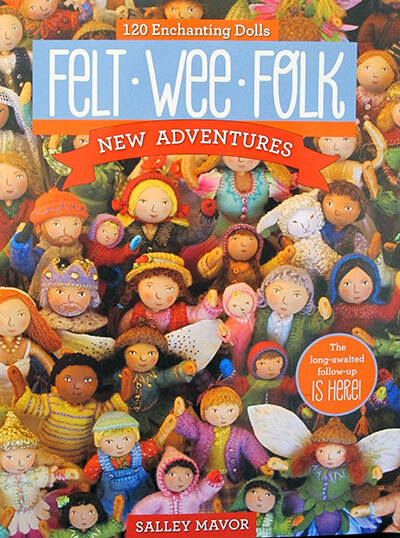 Just a quick note this morning to announce the winner of Salley Mavor’s new book, Felt Wee Folk: New Adventures, which I reviewed earlier this week, and to share some little snips of needlework news. Love your doll, love your work! I think she suits the name ‘Natalia Rose’. I look forward to your newsletter in my inbox every day! Brights up my dreary office mornings. Well, that should cheer a dreary office morning, Candice! Congratulations, and Natalia Rose, she now is. I’ll probably just refer to her as Nat. And if she becomes bothersome, I’ll call her gnat. Just drop me a line with your mailing address, please, and I’ll send that along to the C&T Publishing, who offered the book for the give-away. Here are a few jolly little snips of needlework-related news for your weekend reading and dreaming pleasure. There are some really lovely classes on offer next year. The one that caught my eye – Cristina Badillo from Spain will be teaching a four-day class in Spanish goldwork! This is a great opportunity to learn Spanish goldwork techniques without having to travel to Spain to do so. I would imagine the class will fill up quickly once word gets out that it’s on offer, so if you’ve been hankering for such a class, I’d sign up pretty soon. The whole retreat looks like a wonderful, luxurious experience, and I’ve heard really nice things about their yearly gathering. For the 17th Century Embroidery Enthusiast – a Dream Come True! Is 17th Century Embroidery your Thing? Are you enamored with the embroidered casket, stumpwork, and other 17th century needlework delights? Well, then… you’ve got to read Tricia Nguyen’s recent announcement about the Thistle Threads Embroidered Casket Tour of England & Scotland that’s taking place in October of this year. Oh my! It’s a casket-lover’s dream vacation! For your weekend stitching, you’ll find a free PDF eGuide available for my Fiesta Fob available on the Craftsy website. It’s 22 pages long, loaded with photos and whatnot. It’s called Adding Dimension to Your Hand Embroidery, but it’s more about adding texture. This is a compilation of the series of how-to articles I wrote for Craftsy on adding texture and dimension to hand embroidery, which culminated in creating a little scissor fob. They converted the articles into an eGuide and made it available for free, if you want to download it. Anyway, the nice thing about the scissor fob is that it’s small, it works up quickly, it’s a fun stash-busting project, and you can use it to decorate your scissors, or as an ornament, or as a keychain…or whatever! And the dreadful thing is that there’s a truly horrid photo of me in it. If those links above don’t take you to the Fiesta Fob e-guide (this is especially for email newsletter readers), if you visit today’s article on Needle ‘n Thread, you’ll find the links there and they do work. You must, you absolutely must go see this striking and downright gorgeous piece of crewel embroidery on Anna Scott’s website. Light! Sunshine! Spring! And why I don’t like this weekend. Earlier this week, I enjoyed reading “Twenty Interesting Things About Daylight Saving Time” by Heather Sanders on Pioneer Woman. You may rightly think that, at face value, this has nothing to do with embroidery. But good light has everything to do with embroidery. And while I appreciate the long-light days of summer, they would come anyway, whether I have to move my clock ahead or not. Sigh. Tomorrow morning’s 4:30 alarm is not going to be well met. If I’m grumpy next week, you’ll know why. Maybe I should move to Arizona. Today, I will finish the photo instructions for the last four stitches and stitch combinations for the Floral Sampler Alphabet e-book. I’m still on target for a pre-Easter release! And on Monday, I’ll tell you about my new “regime” that involves one small daily goal to the completion of one Big Project. I’ll let you in on my plan so that you can keep me accountable (oh dear), and maybe you can adopt the approach to tackle something big with your needle and thread. February 20, 2015 A Little News and a Winner! May 16, 2010 I’ve Got Wool Felt – Lots of It. Congratulations to Candice for winning the Felt Wee Folk give-away, I hope you enjoy your prize. It’s a lovely Spring day here in North London the sun has got his hat on it’s lovely. The newsy bits are interesting I really like the crewel embroidery flower and the daylight saving article is interesting. I can’t wait for the Floral Sampler Alphabet e-book to be available and browse through the lovely monograms that you have created. Your new regime sounds interesting look forward to to that. Thanks for sharing your newsy bits with us on all aspects of embroidery. I hope you have a great weekend. Anna Scott’s crewel work is beautiful. I love the colors. Her technique is extra fine. I just stared and stared. Sigh. Lovely. Good inspiration. Now I have to work in the kitchen for a while (after my coffee), but I’d rather be doing embroidery. Congratulations, Candice! I hope you have fun making all kinds of Wee Folk of your own! I loved reading all the name suggestions for your doll in the comments! It gave me a good laugh (or at least a groan!) I didn’t know Needle & Thread was such a clever, corny group of people 🙂 My personal favourite suggestion was ‘Winnethread’. Mary, I always dreaded the spring forward as it messed up my circadian rhythms serious. Well, I must say my crs are in good shape since I moved to AZ but my car clock gets very confused when I go back to San Francisco for a visit since it’s set to DST. Sorry for the grammar error, my laptop keeps having hiccups. Spring forward messes up my circadian rhythms seriously! Congrats, Candice! You are going to have SO much fun making these little guys! Actually, Mary, the link on the website leads me right back to the website. And the link in the email takes me to the corner of unhappy and disappointed …There is an error in your link code. Joan, try opening either Mary’s blog or the link in a new tab. Either one should get you there. And good on you Candice, Natalia Rose to the top! You’ll so love that book. Yes, I’ve been watching that Crewel piece of Anna Scotts. Love the effect of the sdetached chain stitches she incorporated into the leave. Beaut idea. Thanks for the pointer to your scissor fob too. I downloaded that. I purchased Adding Dimension to Your Hand Embroidery class a little while back but haven’t got into it yet. We’ll soon be heading back to normal time here, and readjusting again. At least the new curtains won’t fade so quickly with the sun going down earlier! I must say i am really very very happy to know that your floral sampler alphabet ebook is coming out soon! I’m so excited, I feel like singing that famous song by the pointer sister, i think? Congratulations in advance. I live quite far (philippines) so i hope there won’t be any problem in the transfer/ downloading of files. Cheers and best wishes. Hi Mary, Could you tell me where your purchased the goldwork chunky threads that you were going to use around the edge of the Fiesta Fob, please? You mentioned them just before Christmas. Hi, Catherine – that was from Golden Hinde in the UK. If you look up Golden Hinde goldwork, it should come right up! Congratulations Candice! Salley’s first book was fun & this one looks even better. Have fun making your Wee Folks. Mary, I have to say that it is not a truly horrid photo of you. Of course I have never met you so perhaps you don’t look as pretty or as young as you do in the photo – is that what you meant? Thanks for the fob pattern. I have never bothered with a fob on my scissors but I am beginning to think it’s probably time I did. I must confess to doubts about your colour scheme but it would be a sad old world if we all liked the same thing. Back to the photo and a little challenge – if you don’t like that one, share one you do like.